VOA – The victory of the Islamic Revolution in Iran was an earthquake that upended the political order in the Middle East, and the aftershocks are still being felt 40 years later. When Shi’ite cleric Ayatollah Ruhollah Khomeini ousted the shah’s last government in February 1979 it was a moment that for many was completely “unthinkable, unexpected”, said Clement Therme, a researcher on Iran at the International Institute for Strategic Studies. “The victory was an immense surprise for the Middle East and the world,” Therme told AFP. “One of the founding events for the foreign policy of the new regime was the taking hostage of American diplomats,” said Therme. “For Sunni Islamist movements and for the Shiite minorities in the region”, the message of the Iranian Revolution was “a source of inspiration”, Therme said. “The Islamic Revolution has three levels in the view of the Imam (Khomeini); one is Iran, the other is the Islamic world and the last one is the world of the oppressed,” said Abdullah Ganji, editor-in-chief of ultra-conservative Javan daily. 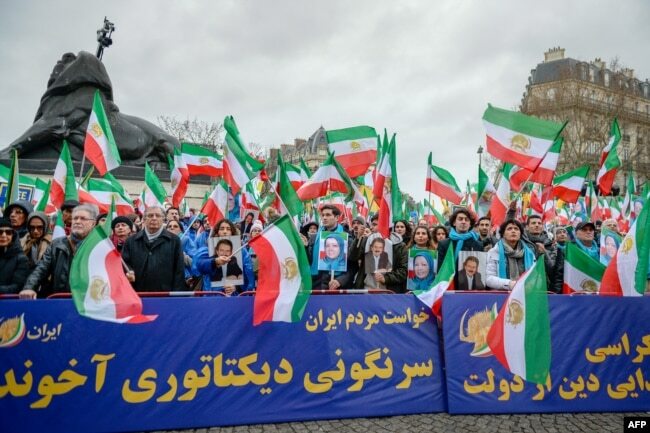 “We did not have any plans at the beginning for the Islamic Revolution to go beyond Iran’s borders,” Ganji told AFP, drawing a distinction with Soviet military interventions abroad. But he said the changes in Iran inspired a string of startling events in the Middle East: attacks against U.S. embassies, protests by Shi’ites in Saudi Arabia and the assassination of Egyptian president Anwar Sadat in 1981. The convulsions rattled rulers around the region and fears of Tehran were “among the reasons that led to the invasion of Iran by Iraq” in September 1980, said Therme. The bloody conflict with Saddam Hussein’s forces ended in 1988 after hundreds of thousands of lives had been lost. Except for some key allies: most notably Syria and the Shi’ite movement Hezbollah that arose after Israel’s invasion in 1982. “There was a division in the Arab world between supporters and opponents of the ‘axis of resistance’ promoted by the Islamic Republic,” said Therme. Ganji said that after the war with Iraq, Tehran developed a “new strategy” aimed at confronting U.S. influence around the region. “The strategy of the Islamic Republic over the last 30 years has been preventing America from having a foothold in the Middle East,” he said. The U.S., Israel and Saudi Arabia see Iran’s hand pulling the strings in a raft of hotspots. Tehran has helped prop up Syria’s President Bashar al-Assad during nearly eight years of civil war, is accused of aiding Shi’ite Huthi rebels in Yemen and maintains Hezbollah as a major threat against Israel. Last year, the U.S. pulled out of a landmark 2015 accord on Tehran’s nuclear program and reimposed sanctions, citing in part Iran’s role in regional conflicts. Conservative Iranian politician and analyst Amir Mohebbian said the West’s “massive arms sales” to Arab monarchies in the Gulf are justified because “Iran remains a danger” to U.S. designs in the Middle East. Analyst Therme said that “militant anti-Zionism” has been one of the constants of Iranian foreign policy since Khomeini transformed the country.